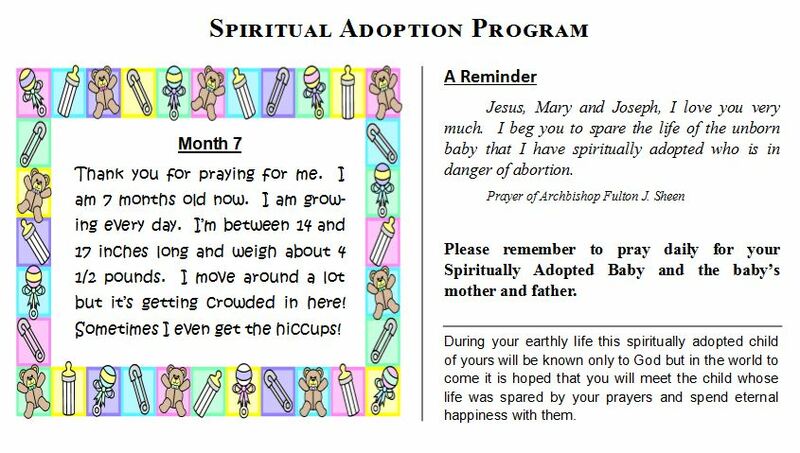 In September, parishioners were invited to spiritually “adopt” and name an unborn child at risk of abortion individually or as a family, thereby giving the baby the humanity he or she deserves. Then they are asked to pray for the unborn child and for all unborn children and their parents, for the power of prayer is great. 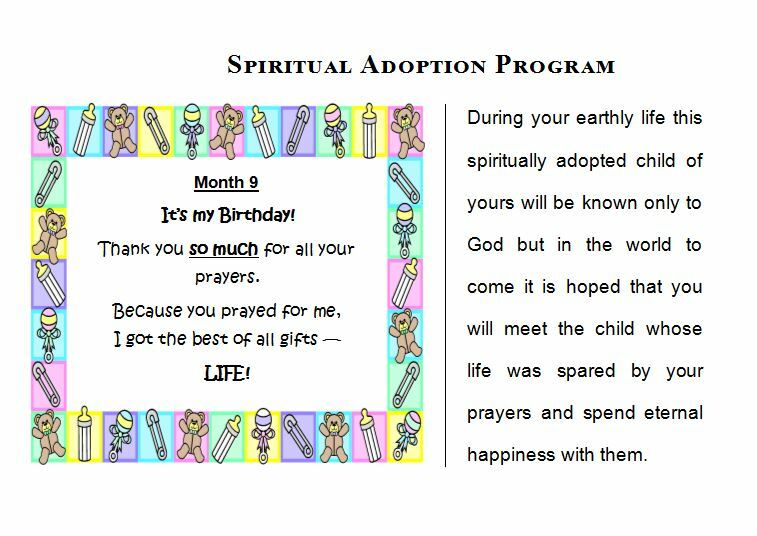 Each month, there will be a description of the baby’s development and birth. In 1973 Archbishop Fulton Sheen wrote a little prayer after the U.S. Supreme Court legalized abortion. Invoking the intercession of the Holy Family, he pleaded for divine protection over unborn babies in danger of being aborted. Servant of God Sheen encouraged Catholics to pray this prayer daily for nine months in the name of the baby. 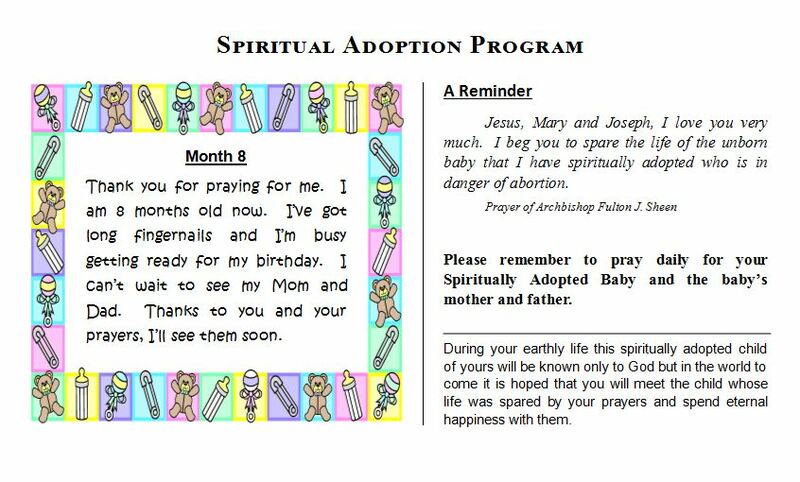 He believed that, by such “spiritual adoption” of specific babies — one prayer at a time — the advance of the culture of death in America and abroad could be thwarted. God made us and all things of nothing (Rom 4:17, Ps 148:5). God makes each person from nothing into His own image and likeness. By the act of His will, He continues to hold us in existence. We depend at every instant upon the God we are made by. If we omit God, we do not see anything as it is but everything as it is not. If one tries to gain something against the will of God, one is tearing against the One who holds us in existence and is our only support. We believe that God’s will is the only law for sane people. 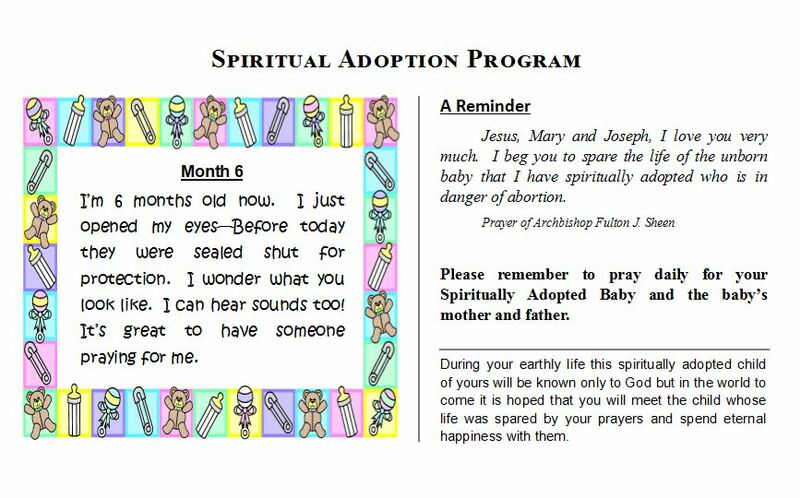 As an expression of God’s love, we have the opportunity to “spiritually” adopt a child who is newly conceived this month. Not all newly conceived babies are allowed to be born. 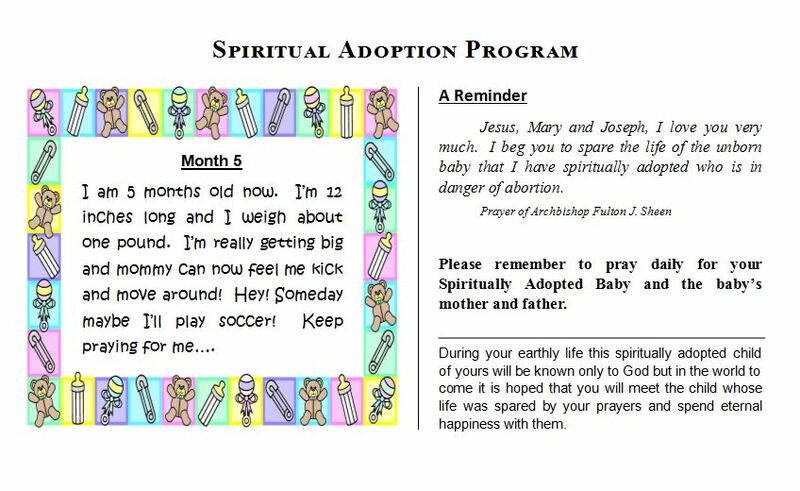 It is these babies you are being asked to “adopt” individually or as a family. 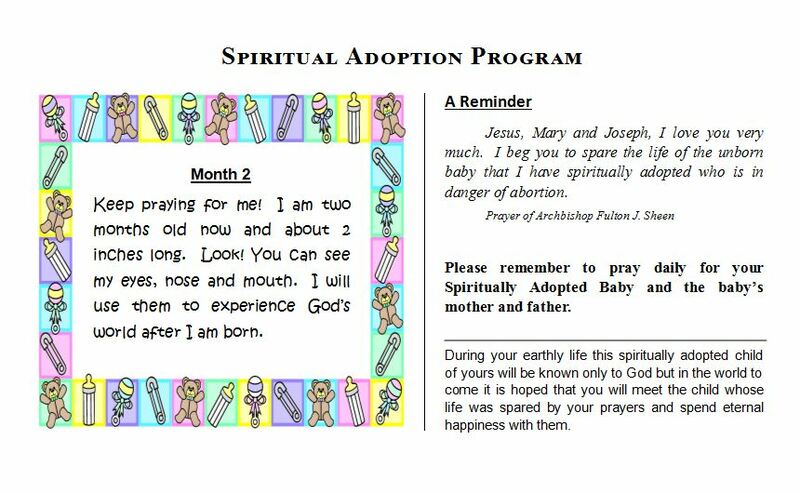 We are encouraged to name the baby for who we are praying. We pray for the baby and the mother each day, reciting the prayer created by Archbishop Sheen. 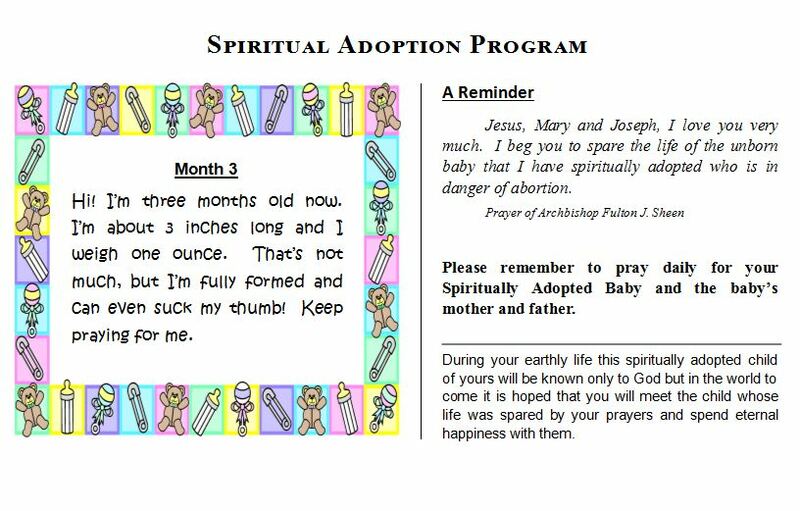 You will receive monthly reports through the parish bulletin and bulletin board describing your baby’s development and birth. There are millions of unborn babies desperately in need of your prayers. 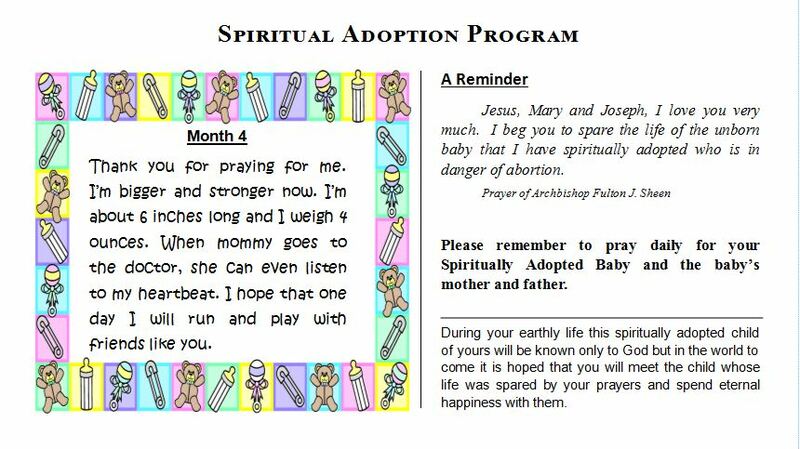 Won’t you please “spiritually adopt” one and share the love for life that God have given you? The Right to Life committee will be collecting baby items for the Spiritual Adoption “Baby Shower” to be donated to the Women’s Care Center. See the list of needed items below. Do NOT wrap the items. 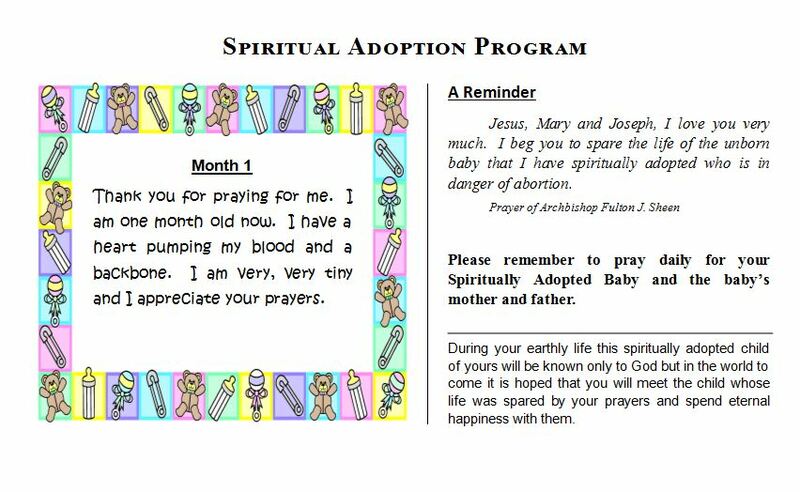 Please place them in the Pack ’n Play located in the Sanctuary next to the St. Joseph statue. IF YOU WOULD LIKE TO MAKE A DONATION, please put it in a marked envelope into the collection plate. Make checks out to the Oxford Women’s Care Center. Call the Women’s Care Center with any questions about the items @ 523-1814. THANK YOU for all your prayers for the unborn and their parents! Keep it up.